My lovely mother-in-law turned 70 last August, and as a present I gave her the choice of any knitted item she might like. After a bit of hemming and hawing, she said she wanted a sweater. Off I went to Ravelry to search for a pattern. After a bit of back and forth, she settled on a lovely pattern from Artesano Yarns. And now, several months later, it's all done. First off - the arms. 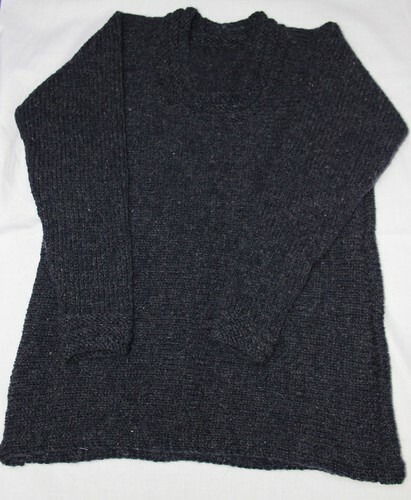 The sweater is knit from one cuff to the other, casting on stitches for the body when you get there. The pattern calls for some seriously belled sleeves, but Mermaid wanted normally shaped sleeves, so I did a bit of math and off I went. Not a terribly difficult change, all in all, but I did have to take some careful notes to make sure the arms matched (since they were knit 2 months apart!). 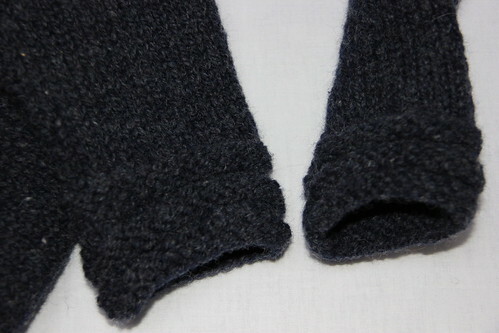 The only other change that I made in this version was to work a slightly deeper collar, to match the cuff detail. However...the pattern, as written, is quite compressed, and I found what I interpreted as a number of errors. 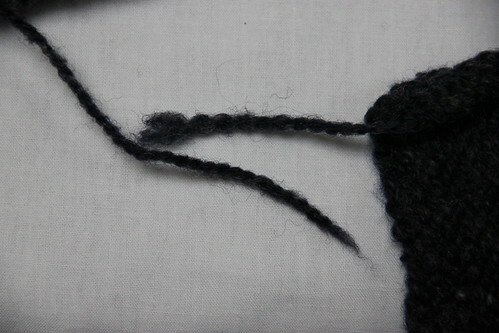 Nothing too egregious - mostly around the shoulder shaping and the number of rows that needed to be worked to get both sides to match. And a couple of instances where it seemed like an extra row was thrown in that would mean working things on the wrong side. It's entirely possible that it was operator error, so take that critique with a grain of salt. It's hard to complain with a free pattern after all. If I made this sweater again (which I'm considering - it's nice and cozy), the only additional mods I would make are as follows: make the body a bit shorter - it's quite long in this version. Might be my gauge at issue, but when I tried it on, it came down way past my hips. I'd prefer it a bit shorter. I'd also change the hem. This has a double thickness hem around the bottom which I'm not a real fan of. I'd add a few of the same ridges that are around the sleeve cuffs and neck to make it a bit more cohesive. The overwhelming upside of this project was the glorious yarn I used. Bartlettyarns are one of the last mule-spun yarns made. This results in a rustic, nubbly, almost-handspun feel that was a pleasure to work with. And as I was seaming up the finished item, I noticed an interesting thing about the yarn after blocking. See that? The strand on the left is the unwashed yarn I used for seaming, the one on the right is the end of my blocked swatch. There's a bit of difference, no? I love how much the yarn poofs up after finishing, and I'm really glad I washed my swatch before I checked the gauge and cast on. Imagine the disaster otherwise! So Mermaid: the sweater is finished. It needs one more bath to even out the seaming, and then it can be on it's way to you. It might go via the Far East though, depending on how organized I get. Hope you can wait! But I'll need some better pictures once it makes it to its new home, ok? 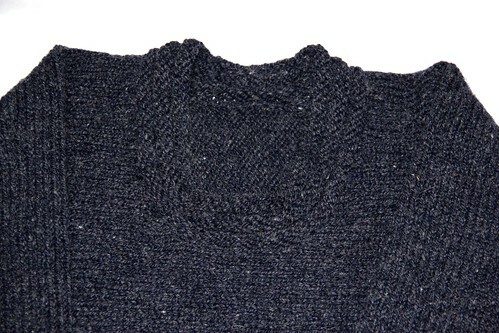 Written by porpoise On January 26, 2012 In "FO", "gifts", "swatching", "sweaters"